Adriaan Boshoff was one of the great impressionists of our time. He was a reclusive man, an artist who was only really happy in his studio surrounded by paint and canvass. But, if any art can be termed an investment, Boshoff’s work comes the closest. Lovers of good art will seldom reach unanimous agreement on who is really the eminence grise of local contemporary painters. But a panel of fellow artists may well field a majority of nominations for one of the enigmas of modern art, a man who shuns the limelight, yet consistently creates some of the most exquisite art made anywhere in the world. 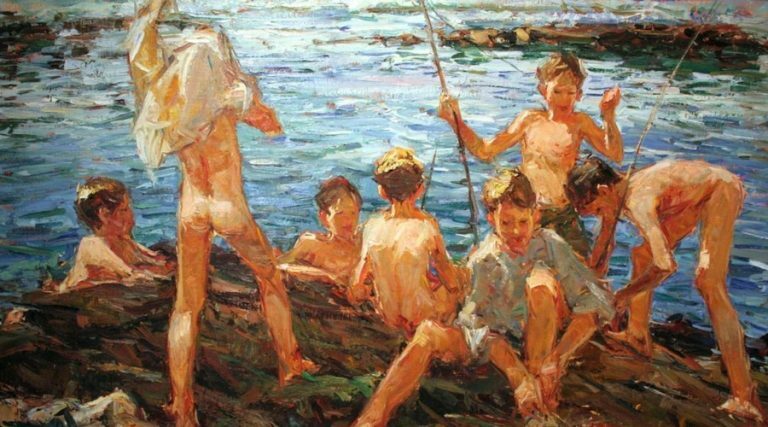 Adriaan Boshoff was a true impressionist, a man who may have made hundreds of sketches before embarking on his paintings. It was this dedication to perfection, coupled with a rare talent and creative ability, that catapulted Boshoff into the forefront of South African artists. He wasn’t always so enjoyed. There were times in his earlier life, recalls his daughter, Louise Boshoff, when he ceaselessly traveled from town to town to try to accommodate his churning need to “move on and discover something new”. Boshoff worked in a new studio built for him at his daughter’s rural home near Hartebeespoort Dam. He was a man who had embraced Christianity with all its tenets and strictures. His faith seems to have helped him discover the inner peace that had so eluded him in his early years – and it is this peace that the art lover sees in the maturity, the grace and, indeed, the serenity of his work. Boshoff was first and always a South African and some of his most memorable works are landscapes depicting the veld with cattle crazing. They have about them the epitome of that elusive spirit that makes South African émigrés long for home and dream of sun-baked days on the stubby veld. Boshoff’s often large canvasses evidence a rare understanding of colour and balance and that essential ability to capture the fleeting impression that is the very essence of Impressionism. He was unreservedly a romantic impressionist, a man who, in the camera of his mind, could retain the precise nuance of an expression he wishes to impart. This imbue his characters with that upturned glance – that arched smile – that help make his paintings come alive and which create a rare concord with the viewer. This points to the crux of his ability; his far-reaching mind, his determination to express the fleeting moment in so many of its myriad guises. It is this rare and wonderful talent that distinguishes Boshoff and which enabled him to tackle a plethora of subjects whereas so many of his contemporaries have settled into a routine of expression that, for them, is now almost a trademark. If Boshoff could be said to have a trademark, it would be that singular ability to express the passing moment in such a wide variety of work. He backs this up with a technical ability that is first-rate and an understanding of colour and harmony that is, quite possibly, unique, at least in South Africa. His work has been exhibited to acclaim around the world and is collected by enthusiasts from New York to Auckland. Like so many great artists, he did not work quickly – he often progresses laboriously to what the untrained eye may acclaim to be the perfect canvass only to tear it up and start again. He was his own, most austere critic.